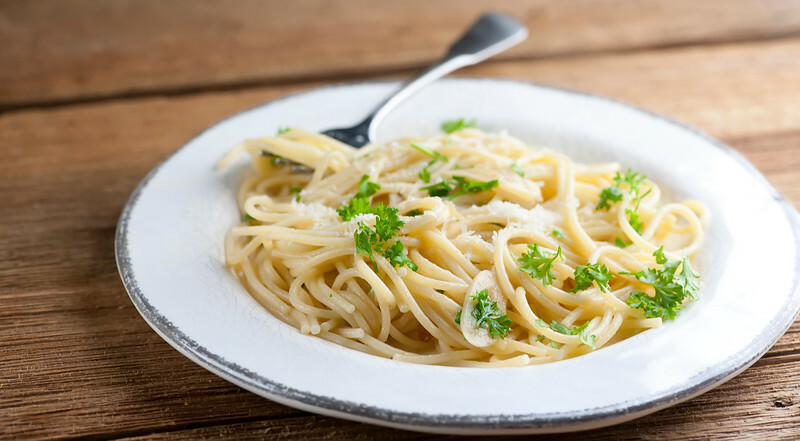 This easy recipe for aglio e olio, otherwise known as pasta with lots of garlic and olive oil, is the perfect supper for busy nights! And (bonus points!) I’m betting you have all the ingredients in your pantry right now. Well, we are out of the summer lounging season and back into the whirlwind of back to school and back to work and getting supper on the table in the midst of a thousand busy things on our list. And that is where this super easy recipe for aglio e olio comes in. Aglio e olio translates to garlic and oil, and that’s exactly what this is, along with Parmesan cheese and a little parsley and of course PASTA. It’s the perfect rush-around-day supper, for all kinds of reasons…not the least of which is that it is 100% delicious. And with that, let’s make it! One of the things about getting supper on the table during busy days is making sure you have everything you need on hand, so you don’t find yourself in the situation of having to send whatever licensed driver happens to be nearby to the supermarket for just one more thing. Can you drive yet? No? Are you sure? Okay, I’ll have to find someone else. Anyway, one of the great things about this recipe is that I’m 99% sure you already have all the ingredients in your kitchen right this minute. Pasta, olive oil, garlic. Some parmesan cheese (not part of the traditional recipe but Oh So Good). A little salt and pepper. Parsley if you are feeling extra fancy. That’s it. It’s ready in about 20 minutes, and after you have a bowl of this I think you might agree with me that there’s nothing else in the world that is quite this relaxing. Maybe taking a nap with your dog in your favorite socks is more relaxing than aglio e olio. But that’s it. Tired but happy back-to-school sigh! 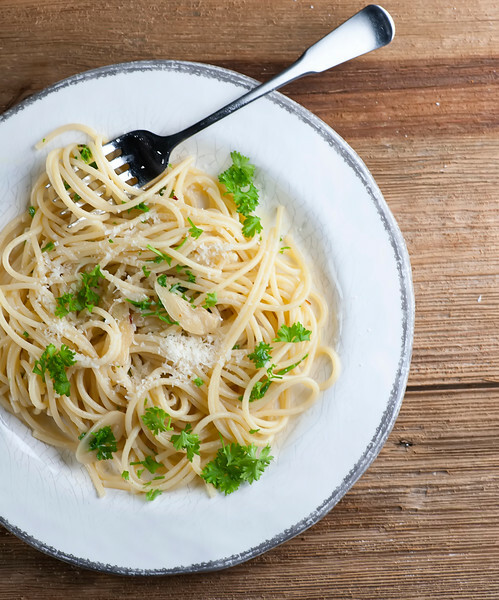 This easy recipe for aglio e olio, otherwise known as pasta with lots of garlic and olive oil, is the perfect supper for busy nights! Cook pasta according to package directions. Right before you drain it, scoop out a cup of pasta water and save. Meanwhile, heat the olive oil over medium heat in a large deep skillet, add the garlic and cook for 2 minutes, stirring frequently, until it just begins to turn golden on the edges. Add the red pepper and stir. Slowly pour in the pasta water and bring to a simmer for 5 minutes. Turn off the heat, add the pasta to the garlic sauce and toss. Add the cheese and parsley and toss again. Season to taste with salt and pepper and divide among plates, sprinkling with a little more cheese. My mom used to make this whenever she had no idea what else to cook…which was at least once a week. I never complained. So. Good. This is one of our favorites – along with just about anything Ina cooks! Sounds really good to me, I love Ina! Love the dog and socks! My Italian neighbor/friend taught me a version of this where you include onions, broccoli and peppers, and simmer in the olive oil until all are tender, then add to the pasta, top with parm, and yum, yum, yum. I've also added ground italian sausage for some spice and protein. I've got to remember the trick about saving some pasta water to add moisture. I love your recipes, and always turn to your blog for good ideas. That picture of your dog cuddling your feet is just too adorable. Oh, and this pasta dish looks super-tasty! I swear my breath must always smell like I’m trying to ward off vampires, because I’m obsessed with garlic! Like, the more (is always) the better! Needless to say aglio e olio is one of my favorite pasta dishes! It’s just so easy, yet super tasty! And yours looks just PERFECT! I’ll take a serving sized bowl of this deliciousness please! Cheers! Ha! Same here on the vampire breath! Love the refined simplicity of this dish! A classic pasta! The simple things are so often the best, right? I wish I could knit! No, one of my oldest dearest friends made them for me – she also has made me a number of fingerless gloves which I wear all winter long.